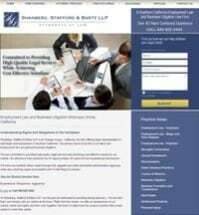 Shanberg Stafford LLP is a business litigation and counseling law firm comprised of experienced attorneys with backgrounds in both litigation and transactional matters. We have experience in all aspects of commercial litigation, including contract disputes, trade secret protection, labor and employment law, and product defect litigation. Our clients range from sole proprietors to small local businesses to medium-sized corporations, and represent a variety of different industries. We provide our clients with quality service in a cost effective manner.